One day, many years ago, we were spending a relaxing afternoon at home. We were cuddled up in our tiny first cottage, enjoying a lazy day with our new baby. Dinner was cooking on the stove, my mom and I were sitting at the kitchen table chatting and my husband was laying on the living room floor watching tv, with our tiny bundle. It was a normal, uneventful, quiet Sunday. Very suddenly and out of the blue, the peace was shattered by a terrible noise. You know that piercing sound, the beeping when your smoke detector or carbon monoxide detector needs a new battery? Yeah. That noise. My mom took over baby duty while my husband and I walked around our teeny, tiny cottage looking for the culprit. Turns out, it was the carbon monoxide detector. It was a plug in, but had a battery back up. We swapped the 9-volt out and all was well. Then the alarm went off again. Really? We were so tired and we had to keep getting up to deal with that stupid thing. Ugh. Why? Maybe the battery we used wasn't new. But the next battery didn't fix it either. That was odd to me. My husband told me it was fine. These things malfunction all the time, but I started to worry. After all, I had a new baby to protect. He explained to me that the heating system had been recently serviced and the electric stove, the only other thing on in the house, didn't generate carbon monoxide so we were fine. It was clearly broken. And I was almost placated by his explanation. After all, we didn't have old burner, a space heater or an attached garage, you know, the usual culprits...but that thing...it kept making that noise no matter what we did. And it bothered me. So I took it outside and left it there and it went off. And it stayed off. No noise. Silence. Then I brought it back into the house and it began to beep and beep...and beep. That's all it took for me, I called the fire department and explained my situation. They too told me it was probably fine, but they'd come check it out. In the meantime, I took my mom and my baby and went outside. I wasn't taking any chances. The fire department showed up, all bells and whistles, and inspected my house. 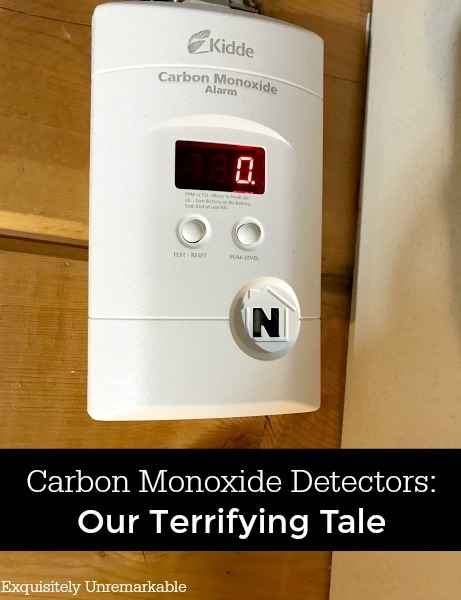 My husband indulged me, writing my behavior off to being a new mom, until the firemen told us we had elevated levels of carbon monoxide in the house. I think they were as shocked as we were. Now, my dad (and then my mom) was in the gas heating business and my husband is extremely well versed in all things construction, and I read. A ton. So we had a very well informed group in the house. We thought we knew every place and way that carbon monoxide could be make its way into our home. But nope. Ok, so I was making beef stew on the stove that day. The electric stove. Not a problem, right? Well, not in and of itself. However, as the pot simmered, the steam began to build and my husband turned the vented fan over the oven on. This went on for hours as the stew cooked. What we were told, was that since the house was sealed up, very well, and no windows were open, the powerful fan created a backdraft effect, pulling the emissions from the normally well vented heating system into the house. I honestly never would've considered that a possibility. Our little house was not that well sealed in my opinion. It was an old, poorly insulated summer cottage from the 1920's. I could smell my neighbor's fireplace smoke in my living room with the windows closed, but they said it was sealed up enough to cause this kind of event. Scary. We had all been feeling kind of sleepy as the day wore on, but we wrote it off to the Sunday afternoon lazies. I don't know if we were truly feeling the effects, but it's all a little chilling. In the end, we just needed to air out the house and we were all fine with a good long dose of fresh air ourselves. Of course, crazy new mama had the baby checked and slept at my sister's house that evening. The levels hadn't been high enough for danger, but who knows if they would've gotten there after a few more hours of cooking. Every time we turn the fans on now, we open a window a crack and we never, ever ignore the detectors when they go off. We have two now, one on each floor to be safe, and so we have another detector to base our information on. We take that noise very seriously and we are actually grateful to know they are all in working order. Even when it happens at 2am, because you know that's when the batteries kick. To be honest, I hadn't thought about this story in long time. My friend Lisa wrote about a detector she purchased recently and the memories came flooding back in. We emailed about it and I vaguely thought about writing it up. Then over Easter weekend we took off for a little beach break and the carbon monoxide detector in the room we were booked in went off the minute we opened the door. The front desk tried to tell me it was fine, just ignore it, they'll change the battery soon, but I wasn't having it. I made them move us immediately. That's when I decided to share my tale. 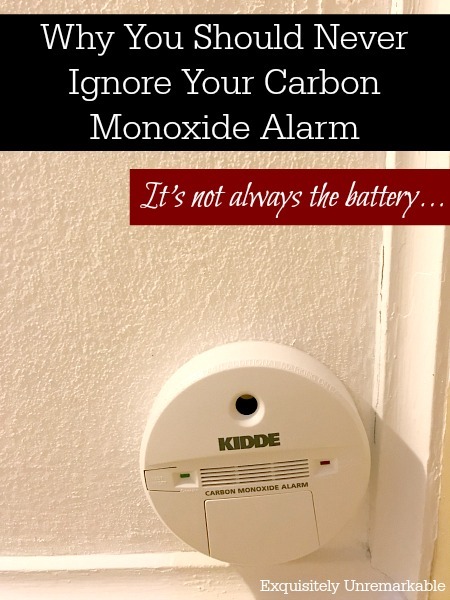 I know that a lot of people ignore the carbon monoxide detector when it goes off. They, like us, write it off to bad batteries or a faulty detector, but that's not always the case. You can't see or smell carbon monoxide and the cause of the problem isn't always clear. It's best to trust the pros. That's what they're there for and that's what they'll say if you call them. Especially on a lazy Sunday afternoon. Here's another tale of home repair. Smart lady! And I love the red! Maybe I need to check out those batteries. 😉 We were young and thought we were well informed and we were not. Thank goodness our lesson was not a deadly one...Have a great weekend, J!! Útil e aconselhável. Feliz fim de semana Kim. Thanks Sandra! I'm glad you found it helpful! Wow, that's scary! I don't know if I have one or not. Will have to go check now. Brenda, I think it’s even more important in an apartment, because you never know what your neighbors are up to. Glad you were all ok, that is so scary! bless you Kim! this is a wonderfully told true tale of public information. it's chilling because we know (at least virtually) the family it happened to. YOU! I'm glad you've reminded us all of the silent danger that is carbon monoxide. After reading this we are going to check to make sure ours has a new battery in it. That is so scarry Kim. Wow thanks for the reminder! So scary, Julie. It’s something you don’t think about very often, or at least we don’t, but happy to know it’s there. Oh Kim how scary. Being married to a firefighter I know the sad stories of sweet families over come by this kind of leak. It kills because it is odorless and people sometimes do not know the levels are high until it is too late. Glad you kept questioning your detector and called the fire department that saved your lives. So scary. Have a good weekend. I knew this one would hit a note with you, Kris, because of your husband's profession. My dad had a gas heating business and we grew up with gas in the house, so I knew exactly how to recognize that scary problem, but you're right, carbon monoxide is terrifying because there is no smell or warning. You are a super smartypants, Judy, with that open window. Better safe than sorry, for sure, especially with certain types of heat sources. I used to hate that battery beep, now I am happy to know the detectors are working! What a scary ordeal. Thank you for bringing it to our attention. Bottom line - CO detector sounds an alert, do not ignore it. Even though DST went into effect a few weeks ago, for those readers who did not remember to change batteries in their CO and smoke detectors, it's not too late to get that done. Thanks again, Kim, for sharing an important message. 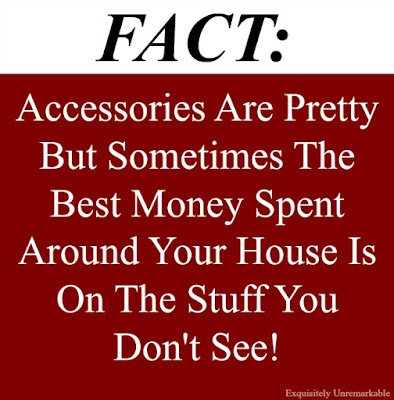 Cindy, that's an awesome point and a great reminder! Time to change those batteries. I always remember in the fall, but sometimes not in the spring with the change back. I bet a lot of people are like me. I appreciate you weighing in with that important reminder. We travel several months a year in our class A motorhome. It has a CO detector. When it was new, that detector went off often and we had plenty of calls to the power company and/or fire department. Everything was fine each time. We finally figured it out...my hairspray sets it off. So, because we are very careful with safety I have to hide in the bathroom, with the door closed, with the fan on overhead, to spray my hair. Then I have to wait a minute or so to open the door, if I open it too soon, it goes off. A few months ago I followed "hairspray protocol" and it went off anyway. So we called the fire department and here they come and we had a issue! Nothing major, but always better safe than sorry (even tho my "hairspray protocol" is kind of a pain. lol). Terri, thank you for sharing your story with us. You know the whole hairspray thing is one of the reasons my husband was so quick to write the beeping off as nothing. We'd heard that certain odors could set the detector off and my mom we wearing perfume and hairspray. I am so glad you did call, because like you said, you just never know. I never thought about bringing one along when we stay somewhere, Teri, but after this weekend's experience, that sounds like a super smart idea. Wow. You guys are very prepared. I bet you have a lot of people thinking now. Thanks so much for sharing!! We had our carbon monoxide detector go off once too. We opened the doors to air out the house and waited outside. We were told that they often have false positives but they came and checked. We didn't have elevated CO levels and we got a new detector and it didn't alarm. Lots of good suggestions in the comments. It’s scary, Lorri, but yup, there are a lot of false alarms. Literally. I think that’s why we were so quick to write it off as one. Now we have two, so if they both go off we can feel sure. And I love the tips from others, too. That one from Teri about bringing one with you. Genius. Especially after our own weekend hotel experience. Yikes. Hope you have a snowless weekend!! We are expecting more. Boo. That is really scary! We have a detector, and so far it hasn't gone off. Glad you stuck to your guns and had it checked. Thanks Mari. I think that new mama instinct kicked in. Thank goodness! Wow, that's a scary story, especially with a small baby at home! I had no idea a vent fan could do that. 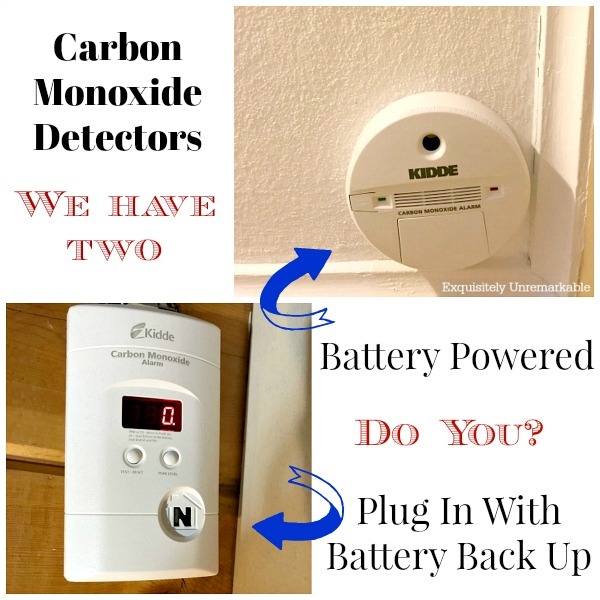 Carbon monoxide detectors (and smoke detectors) are so very important and everyone should have them in their homes. I saw on the news that an entire family was killed while on vacation because the house they stayed in had a carbon monoxide leak and no detectors. Gosh, that's terrible. I'll take a plug in detector with me on vacation from now on. Thanks for a very informative post! Now that is terrifying. I never thought about bringing one of vacation with us, but as I said, after this weekend's experience, Teri's advice and now your story, I am buying an extra to take along. Thanks so much for posting about the detectors. As I said, that's what got me thinking about the story in the first place! Our apartment has a combined smoke and carbon monoxide alarm on the ceiling. Our insurance rep said we should get a separate carbon monoxide alarm to put low to the ground. Since carbon monoxide is heavy by the time it reached the ceiling we would be in goners! This is a great tip, Ellen! We have one low to the ground, but the other is up high. Oh boy, need to change that ASAP. Thanks so much for sharing your information with us. The comment tips are proving very insightful indeed! It is scary, Marilyn and I too am going to bring one our trips. Clearly not every place is equipped with one. We also have the plug in kind, that was the one that alerted us to the problem, thank goodness. I like the plug in best, too, especially since it has a battery back up in it, because we lose power at the beach a lot. The storms can be wicked. When the power goes out, so does the detector. The battery back up helps, since a lot of people without power use space heaters or wood burning stoves which have caused problems. Kind of scary all the way around isn’t it? Scary indeed . . .
We have three smoke detectors and two carbon monoxide . . . Thank you for the tip . . . Thanks Lynne...lesson learned for sure. Thank you Kim for this post! No we don't have carbon monoxide alarms. We have smoke alarms. I was told that if all appliances are electric than you don't need it. Humm, next Monday I will buy one. Have a wonderful weekend. I am not sure about all the ways CO can get into your home, Angela. However, I do know that even a wood burning fireplace can give it off. How much, how dangerous, I do not know. I guess I would check and ask the fire department what they think. They'd know! Good luck. WOW Kim what a story! No I don't have one / thanks for the info! Oh no, Deb, you should get one. Wow Kim. That's very scary. I wonder if it's the reason all of you were feeling sleepy, but I'm glad you persisted and had it checked out. Thank you for sharing your story. Every year we have a family die in Wisconsin from Carbon Monoxide. This year it was a grandpa and his grandson at their hunting cabin. It is a true problem in our neck of the woods. We have two carbon monoxide alarms. We also have two smoke alarms. That is so sad, Carla. I really hate hearing stories like this because they are so preventable. That is really scary, Kim! Thank God you followed your intuition and called the fire department. We have two carbon monoxide detectors and smoke alarms - one upstairs and one down. It was scary, Melanie and a good lesson…since it had a happy ending. Ok, I’m laughing a little now. Not because of YOUR story, but mine. Sounds like our hubs are opposites lol. That is really scary, Kim. I am a firm proponent of "better safe than sorry". We have had a couple of deaths in this are due to carbon monoxide and it is really scary. One of my father-in-law's friends came home late one night-pulled the car into the garage and fell asleep at the wheel and his wife didn't discover him until it was too late. So sad. The garage is a scary one, Diana. I remember my mom warning us all the time, when we were younger, to shut the garage door. It opened into the house and she was always afraid someone would leave the car idling or forget it was on when warming it up or something like that. So scary. We have two as well but thanks for the reminder. This is terrifying and I'm so glad you trusted your intuition! We do have a built in system but adding a battery operated one is a great idea. We have had strange things happen with the built in detector so more than one is smart. Thanks for the heads up. I'm glad I read this post because it reminded me of the unopened CO2 detector we still need to install. We just went under contract to sell our home and by law have to install one. After reading this I'll make sure my new home has one on each floor. So glad you family with a its newbie addition were saved by one! The implications are just terrifying to fathom. This is a good post to share...who knows whose lives you'll save by encouraging the rest of us to either install one or double check the batteries. It really was scary, Audra, and like I said, we thought we were very well informed and it couldn’t happen in our home. I really thought it would be a yawn of a tale and everyone would respond that they had a detector, etc., but now I am so glad I did. And good luck with your move! That is so exciting!! I had a kerosene space heater in my tiny house. One morning I was feeling very spacey. My neigbbor noticed it when I called her on the phone. She told me to get out of the cabin immediately! When I called school to see how my son was feeling, the nurse said he had some cognitive issues that morning, too! As soon as my head cleared up, I went back in, turned off the heater, took it outside, then went to the store and bought an electric oil-filled heater! Thank God for that neighbor! That was the first time she saved my life. But the second time is another story. I will now go move the CO detecor closer to the floor. Very scary, Nancy. It's so stealthy, it's really too late by the time you know about a leak. You are so lucky your friend was there for you that morning...and it was a blessing your son had a reason to get out when he did. Even knowing that it ended well, that was a scary story.